Hi friends! You're in for a super fun treat! 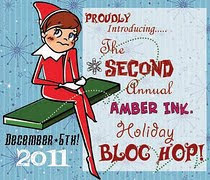 Today is the second annual Amber Ink Holiday Blog Hop! To start the hop, head over to the Amber Ink Blog. 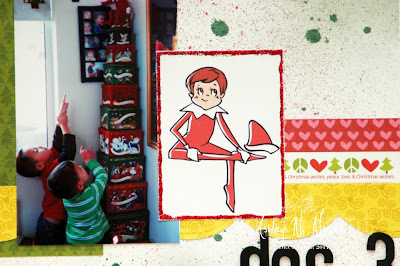 This year's blog hop theme is Elf on the Shelf! Woot woot! I love our Elf! A bunch of the Amber Ink alumni and some of us newbies are joining together to show you some fabulous projects! You'll want to leave comments on the whole hop! There will be a winner from each blog for some awesome Amber Ink Elf images and one GRAND PRIZE winner will get an Elf on the Shelf set from Amazon! Here's the layout I made for this hop. Now, please don't have a heart attack! I KNOW! I'm making a layout with a digital element, that's so unlike me but it was SUPER fun! I used the Have a Sat: Color! DIY Printable. I choose the printable because it's SO easy, just print and you're ready to create. Now, I do love to color but sometimes it's nice to to just have something done FAST! This is a page for my December Daily album using Bella Blvd paper and Whisker Graphics Holiday Divine Twine. Have a great day, everyone! And enjoy the hop! There are elves and prizes behind every badge. What an adorable layout! Loving that the printables are already colored in! This is adorable! Love that picture. That is so cute paired with your awesome photo!!! How super cute - the layout works perfectly with that image and your photo is fantastic! Great photo - just perfect! Well how perfect is this? So glad you used the printable! 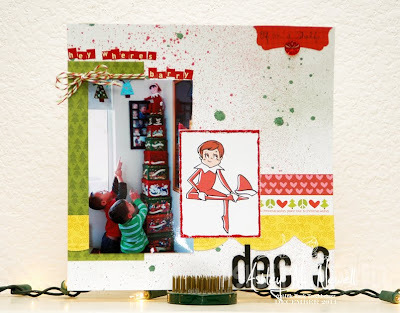 What a fantastic layout you've created and a perfect album keepsake with your darling boys! WTGO! Such a great LO!!! Love the photo!! I need to take pics of where the elf in my house ends up!!! His name is Jack (Frost)! That photo is priceless!!! Love your LO! Great idea - this is so cute! So cute! I'm really enjoying seeing everyone's elves! Cute layout! The photo you used is adorable! Oh Ashley this page is absolutely adorable. Love all those stacked boxes. Love it! what a great idea to add to a scrap page! Love your LO!! Such a fun picture as well!! I love seeing other people's elves!! Blessings and hugs!! This is so fun. I love the layout. TFS. What a perfect combination -- your photo and Amber's elf. Nice!